Left: Beet with goat parmesan. 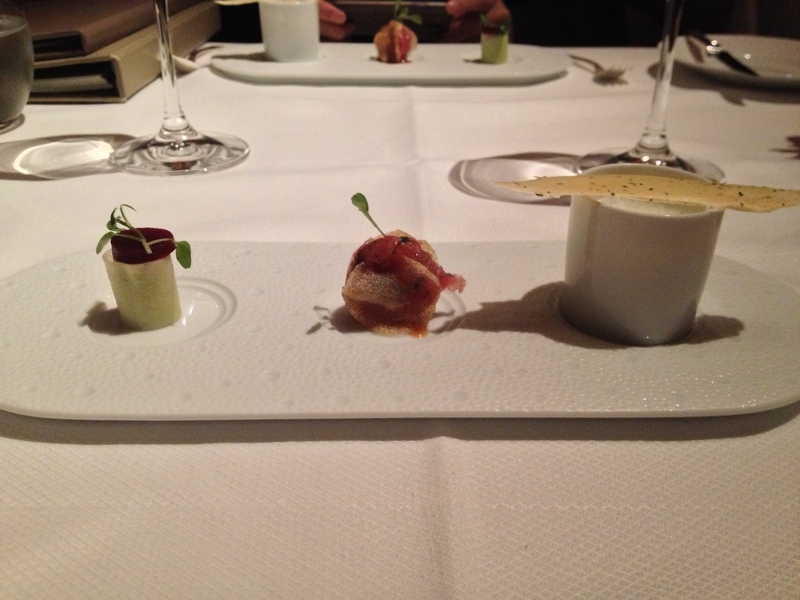 Middle: Tuna tartare with soy glaze and potato crisp. Right: Cauliflower soup with potato foam and parmesan tuile. Monte: Oh mah lordy lord this was a marvelous start to the meal. From left to right you first get a soft cheesy bite of sweetness, next a wonderful textural contrast with crispy and creamy salty goodness, and lastly a wonderfully aromatic rich soup. Wunderbar. 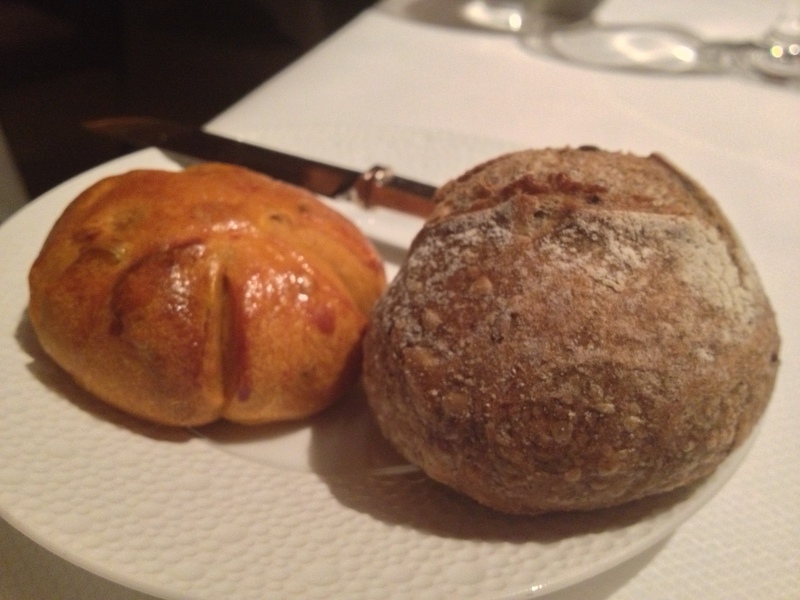 Monte: Great sun-dried tomato flavor with a soft fluffy interior, and a buckwheat with a deliciously crispy baguette-like exterior. The bread is from Maison Kayser but for some reason it just tastes even better here (and I was already a fan of the bakery!). Layers of thinly pounded yellowfin tuna (topped with chives and extra virgin olive oil) over foie gras terrine and toasted baguette. Monte: This is one of the most delicious things I’ve ever had the pleasure of eating. It’s velvety, rich, and just melts in your mouth. It’s also quite gorgeous how they shaped the tuna. Victor: I second what Monte said about this being velvety, rich, and melt-in-your-mouth. 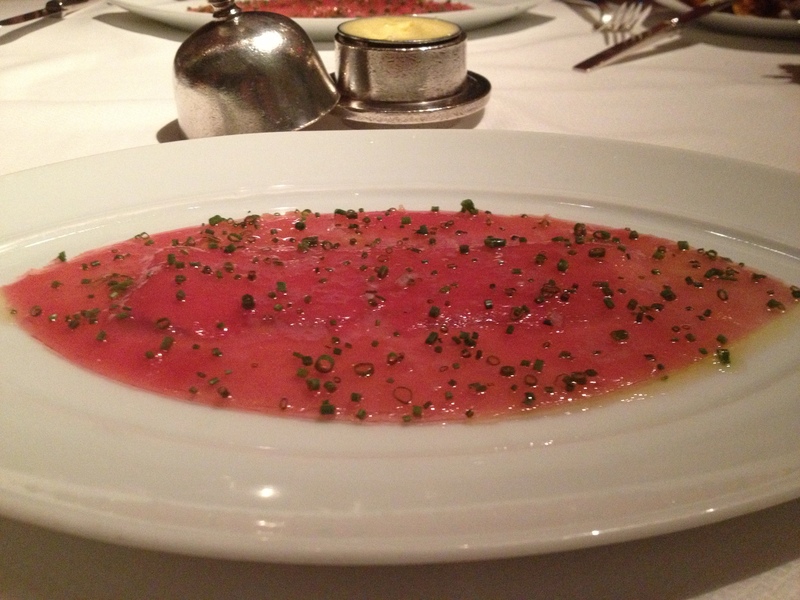 Tuna topped with EVOO and foie terrine? Yeah, it’s definitely going to be very rich haha. The baguette provided a nice earthy taste and crunch that contrasted the tuna and foie. 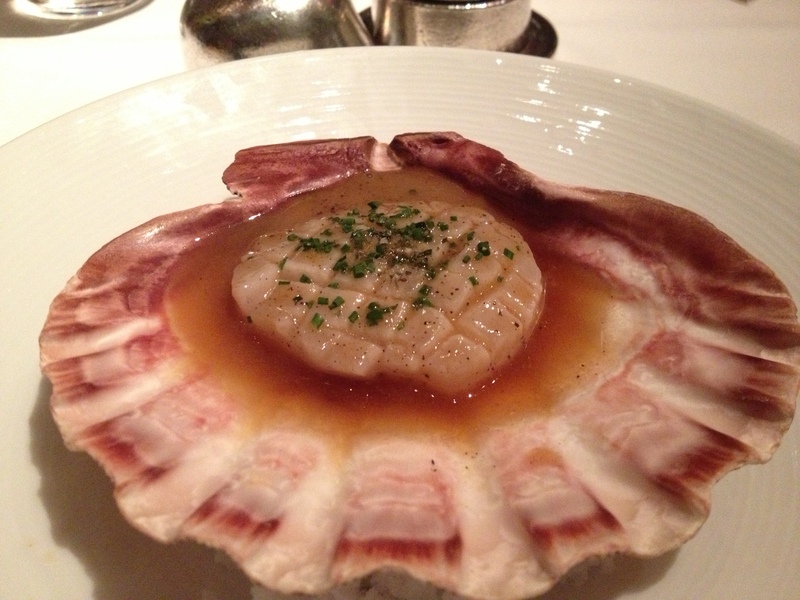 “Barely-cooked scallop” that was brushed with brown butter sauce, topped with chives, and served with dashi broth. Monte: This dish is a little more complex than the previous one. The sweet scallop had a great delicate texture and the sweet and salty dashi and brown butter really added layers to an ingredient that was already very rich. The chives do just enough to slightly cut through the richness without taking anything away from the dish. Poached Maine lobster, roasted tomato, celeriac, black chocolate, and truffle butter sauce. Monte: This dish was even richer than the previous. The truffle sauce is insanely creamy and rich, and sniffing this stuff like glue just overwhelms the senses (in a good way). Oh and the lobster was well cooked too. Victor: Monte moaned here. It was that good. That is all. Wild salmon (lightly cooked from the bottom—it’s rare from the bottom to the middle) with sweet and sour hon shimeji mushrooms, pea tenders, slices of lotus root, and maitake mushrooms. 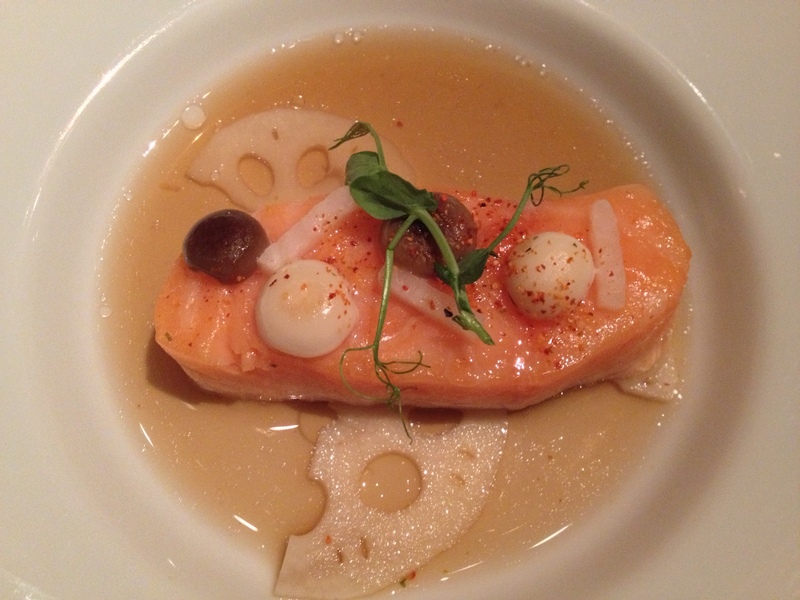 Monte: Quite a contrast from the prior dish, it was still delicious and the salmon was perfectly cooked. Still, the light and delicate flavors of the root vegetables and fish were jarringly different from the intense rich flavors of the lobster. 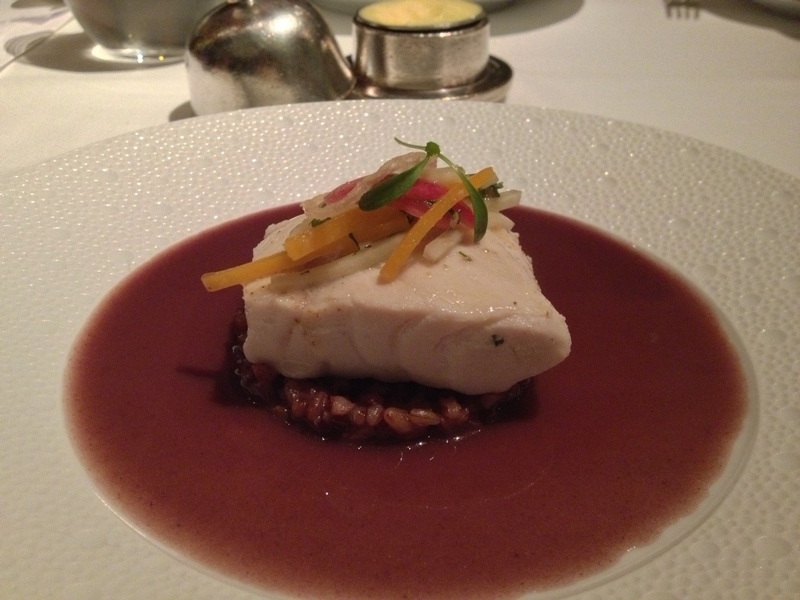 Baked striped bass, green papaya salad, Bhutanese red rice, and ginger–red wine sauce. Monte: Very earthy and spicy flavors in this one. I also loved the dishware itself – the foamy dimples were a great touch. Victor: This was actually my least favorite dish of the meal. Conceptually, it was interesting. As Monte said, you have really earthy flavors here, and in a way this was both the most exciting and least exciting dish. Conceptually, green papaya salad, red rice, and ginger–red wine sauce sound fascinating; you wouldn’t really expect these dishes to go together. 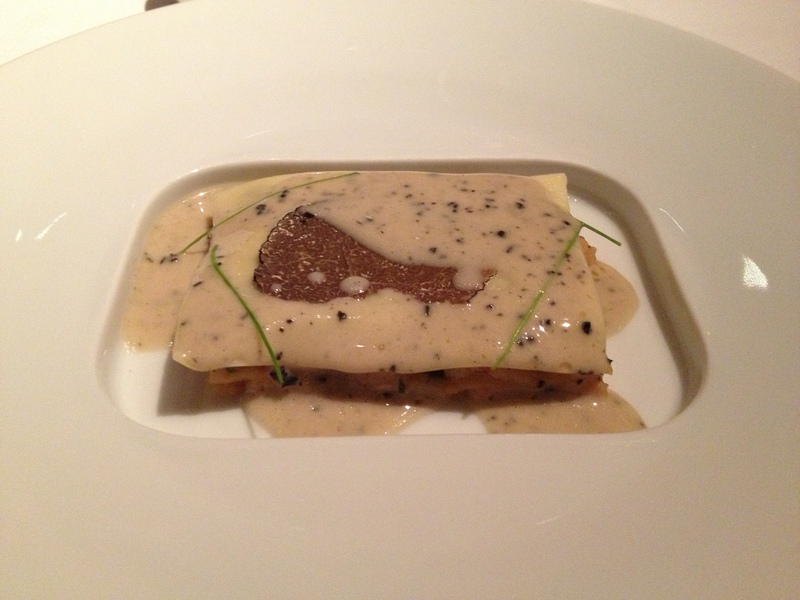 At the same time, it didn’t have the richness of the tuna or lobster lasagna or the delicateness of the salmon. I’m happy I got to try this dish because of how interesting the ingredient combination was; however, it just wasn’t nearly as delicious as the preceding and succeeding courses. 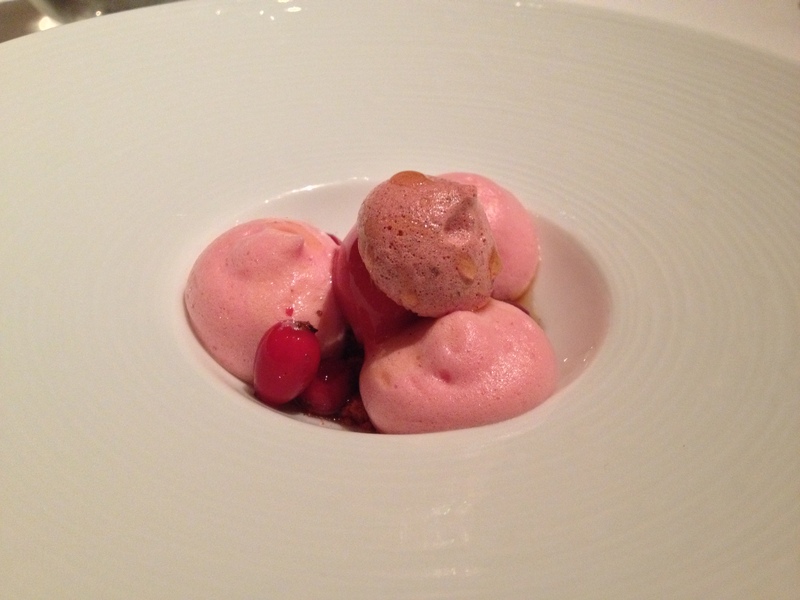 Cranberry sorbet, compote of lightly poached cranberries, spiced squash, cranberry meringue, and maple syrup. Victor: I didn’t touch this dessert because I didn’t really want to have too many carbs for the day. Monty had some, though, so he can tell you how it was! Monte: This was a bit too tart for me, but I don’t waste food so of course I ate it all. 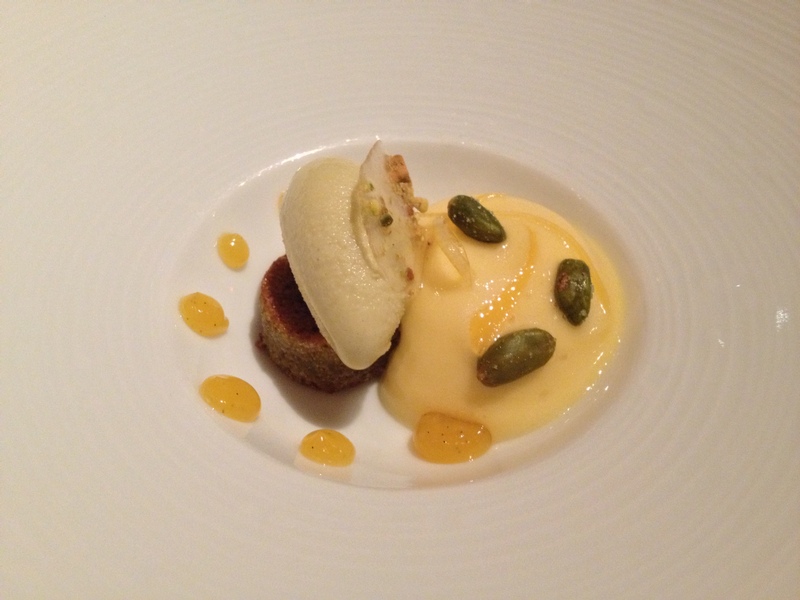 Pistachio ice cream, pistachio financier, passion fruit mousse/foam (it’s like a cross between the two), and meyer lemon sorbet. Monte: So after trying this one and loving it, I felt bad about finishing my cranberry one. But not quite, since I ended up eating 95% of Victor’s replacement. Pistachio and passionfruit is an amazing combination. 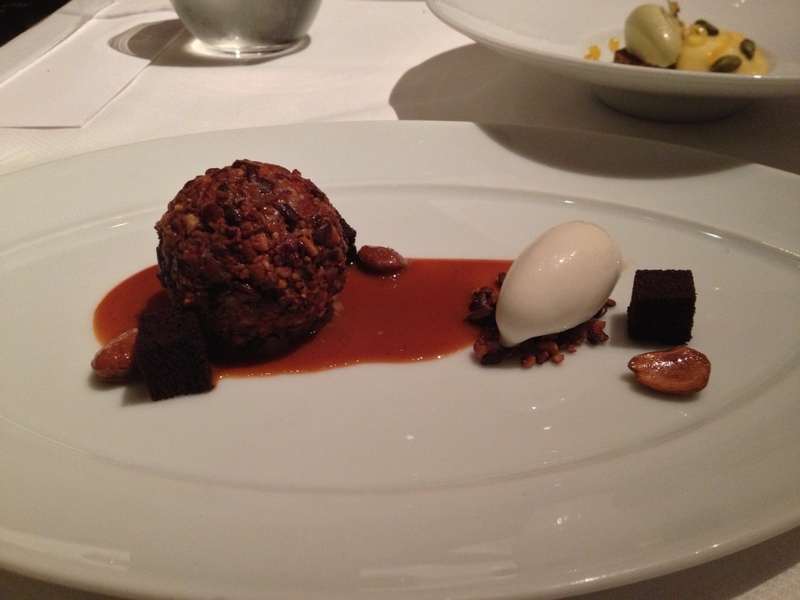 Half-frozen dark chocolate mousse (rolled with crushed candied almond) with cut olives, goat’s milk sorbet, dulce de leche, Marcona almond, and chocolate sponge. Victor: I didn’t want the waiter to give us another dessert, so I had a few bites of this. It was DELICIOUS. The chocolate mousse was decadent and sweet, while the candied almonds helped add some “crunch” and prevented the dessert from ever feeling too rich. The goat’s milk sorbet was a great complement to all the chocolate. I don’t remember too much detail about this dessert, but Monty can tell you all about it! Monte: The crushed candied almonds surrounding the frozen mousse were a bit too bitter and intense to make this dish perfect for me, but the crunch and sweetness of the dish was rather good. I wish there was a bit more of the goats milk sorbet to help mellow out the almonds. 1. Dark chocolate bonbon with cinnamon caramel. 2. Salted caramel with chocolate fudge. 4. Financier with brown sugar and fig. 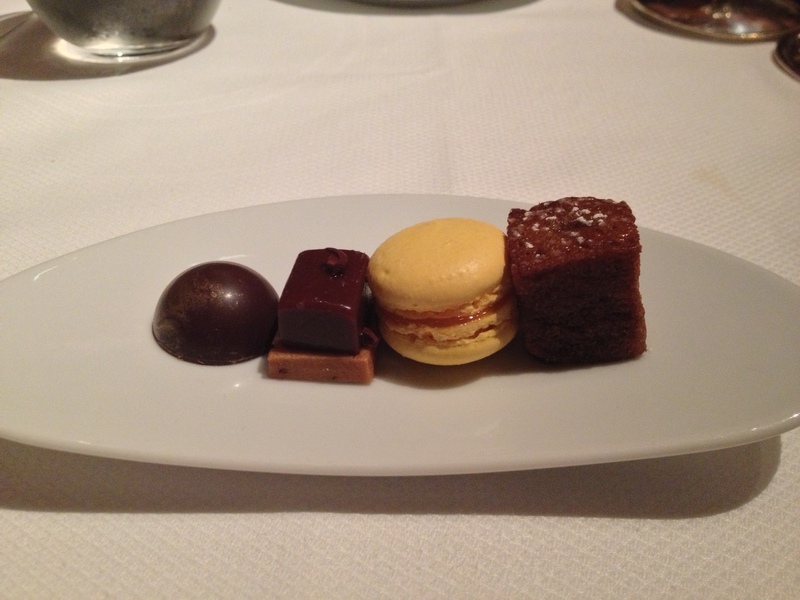 Monte: The macaron is probably the best I’ve had in my life. Yes, better than laduree. Gah I love this restaurant.